My son is starting school soon where they require the students to wear uniforms. I first came across French Toast because they were on the list of recommended stores where I could find the school uniform items he needed. After a little research I discovered that they were practically the best buy out there for boy school uniforms and girl school uniforms, even beating or coming very close to the prices at big box stores. Plus, they give back 5% cash + FREE School Technology Products to your school. How’s that for getting what you need for a great price and helping out your school out at the same time?!?! For this review we received 2 short sleeve polo shirts (1 made from Interlock Knit and 1 Pique), a pair of flat front adjustable waist shorts, and a velcro-closure leather belt. We love the fabric of the shirts! I did not realize the difference in texture until we received them. All the shirts in the other stores are practically the same blends of cotton and polyester, but these are SOsoft. Especially, perfect for those who can be sensitive to texture. I love that they have an option for adjustable waist shorts and pants, too! Finding shorts for a growing boy that actually fit right can be hard. But with the adjustable option I know they are going to fit just right, even if I accidentally bought them a little too big! And the velcro-closure belt is perfect for any child just learning to wear a belt or wanting to wear one like the big kids. Knowing my son can undo the belt quickly when needed makes this mom feel a ton better about his ability to be independent during potty breaks at school. That is one sharp looking kid! Want to know some more awesome things about French Toast? They have a large variety of stylish clothing for boys and girls as well as popular school colors. Even great for church, too! French Toast has a monthly drawing for one year’s worth of school uniforms ($150 value)! Hop on over and check them out! French Toast is graciously giving one Fun On A Dime reader 1 top and 1 bottom of their choice! (Mandatory Entry) Go to FrenchToast.com. Take a look around and tell me what you would get if you won. Leave a comment once completed. Follow Fun On A Dime on Twitter OR Facebook (one entry total). Leave a comment once completed. Leave a separate comment for each entry! Mandatory entry must be completed first before any bonus entries will be counted. This giveaway will close on August 16th, 2011 at 11:59 pm EST. Winners will be notified by email and will have 48 hours to respond or new winner will be chosen. US residents only! This is awesome! My kids don’t wear uniforms, but my son is in need of some new church clothes!! I’d totally get the adjustable pants with the double-knee! He always seems to blow out the knees on his trousers, having a double-knee option is just awesome! I’d have to go for the long sleeved Oxford shirt too, I think that would make a pretty snazzy little get-up for church! I would love the zipper front sweater and a Boys Adjustable Waist Double-Knee Pant – love them!! My niece and son’s school only use french toast and it all has to have the school logo. 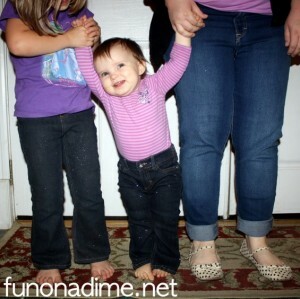 I would love the Girls Tie Belt Pants and peter pan blouse as a gift for my niece. ohh and thanks for the chance to win! My niece and son’s school only uses french toast uniforms. Winning this would be awesome and save a bit of money too. If I won I love to gift my niece with the white peter pan blouse and navy tie belt pants. Thanks for an awesome chance to win. I liked Fun On A Dime on Facebook!!! My son is always wearing out the knees of his pants, so I’d go for the pants with the double knee. I’d also get several polo shirts and the adjustable belt. My son is always wearing out his clothes or messing them up, so new ones would be fantastic. I’d definitely order the short sleeve polos for my son…he wears them all the time and to have some that don’t fall apart or stretch out weird for the same price sounds great. I would get the pique polo with navy trim and the boys adjustable waist double knee pant in khaki. I like that French Toast offers plus sizes. With my daughter being short the plus sizes offers the width that she needs plus the length. I would order the girls adj. waist pants in black and the short sleeve pique polo in red. I love the shoes! We don’t need uniforms but we need closed toe shoes and we couldn’t find any that would stay on my daughter’s feet that aren’t gym shoes. I would get a pleated skirt and the boyfriend duster sweater. They have some really cute stuff.